It was my birthday on Thursday and I am now a proud owner of a Sunflower Swift. How excellent is that? Not that I've had a go at winding anything yet, but I've been itching to dive into the stash looking for a suitable skein all weekend. Pesky housework and a steely desire to work on ongoing projects stopped me, but oh the temptation. I've also got a good haul of books, all on knitting or crochet. Some are very old and are ex library stock from the Knitting and Crochet Guild. Every single book looks interesting and is full of things I'd love to make... Now if only I had the time! Yesterday we made a rare trip the the Cinema and saw 'Up' which is a very, very good film which I highly recommend. It was a bit sad in places, but had a strong story, likeable characters and was very well animated. A good choice all round. We'd intended to go to Nando's afterwards, but on arrival we were told to expect a 30+ minute wait for a table, followed by at least a 45 minute wait for food to arrive. Dave and I were hungry cinema goers and couldn't wait that long, so we nipped around the corner to Pizza Express where we were seated immediately. I felt a bit underdressed but otherwise it was very good, the food was seriously hot (scaldingly so) and very tasty. Yum. Hmmm. It's not as easy as it looks. Trying to ply three singles, with the same plying point to produce an even yarn rather than a two ply with a third ply wrapped around it, was very tricky. Keeping the singles evenly distributed in my hand was difficult enough, trying to keep the tension steady as they came off the bobbin was the seriously hard bit. And every time I had to let go with my back hand to move the plied yarn onto a new hook on the flyer, things would go to pot. I was doing it though. Not necessarily very well, but I was doing it. And then Dave walked into the room and offered to make a drink. At that point, my carefully positioned fingers became all thumbs and I lost control of the yarn. It was like I just couldn't concentrate on even a simple question and still make like I maybe knew what I was doing. 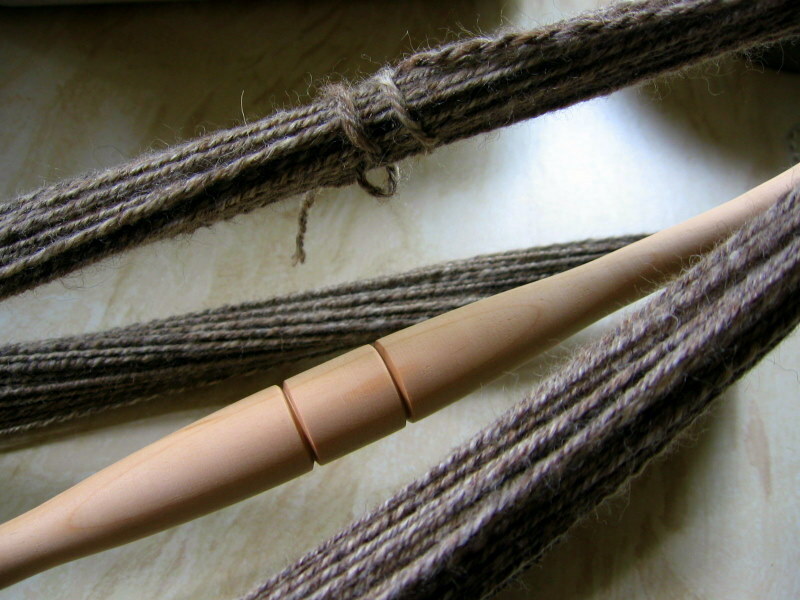 Here the yarn is on the niddy noddy, straight off the wheel and to be honest it doesn't look that much different from the two plies I'm used to making. It looks like yarn and under tension it looks fine - still a little on the skinny side, but that's just my singles being thin to start with. Here it is once I took it off the niddy noddy and before finishing. 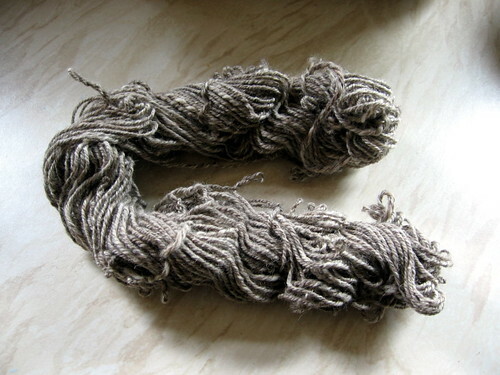 You can see that there is a lot more plying twist than spinning twist... Now part of that is down to the fact the singles had rested, so don't have the same spoingyness of a freshly spun single, so the stronger twist is always going to be in the plying. I need to finish it now... Then I can see if it my first three ply may be considered a success. Happy Belated Birthday, I think your choice of film was excellent. Your yarn looks very pretty.